The Double Column design and heavy saw base provide a rigid, stable and rugged cutting platform for any application. Multi-function digital controller with piece-counter, piece presetting, work timer, diagnosis and alarm messages. Automatic control over cutting length. Adjustable sawframe return stroke. Hydraulically powered multi-feed system moves the material into the cutting zone, reducing indexing time and speeding the cutting process. Tough heavy-duty precision blade-guide with hard metal pads, bearings and anti-corrosion treatement. Electronic sawband speed variator (Inverter). 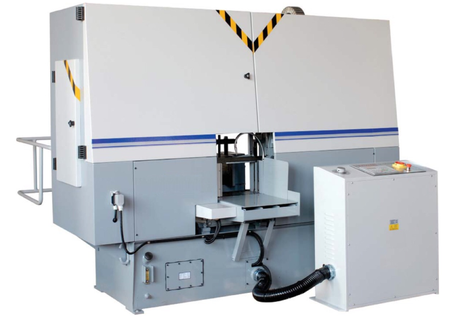 Semi-automatic cutting cycle: vice adjustment through panel switch - semi-automatic start through control panel switch - the machine carries out a complete cutting cycle including vice locking, sawframe downfeed, cut, sawframe return and vice opening. Automatic cutting cycle: vices adjustment through panel switch - run a program (number of pieces to cut and cutting length are typed in) - automatic start through control panel switch - the machine carries out a complete cutting program including material feeding, vice locking, sawframe downfeed, cut, sawframe return and vice opening. Machine bed in thick metal works exclusively made by domestic workshops. High level machining and finishing of the parts. The sawframe is guided on two play-free independent columns minimizing friction and wear, and affords a smooth and even traverse as the sawframe raises and lowers.Bench vice and feed vice with full stroke cylinders. Multi-function digital controller with piece-counter, piece presetting, work timer, diagnosis and alarm messages. Adjustable sawframe downfeed speed. 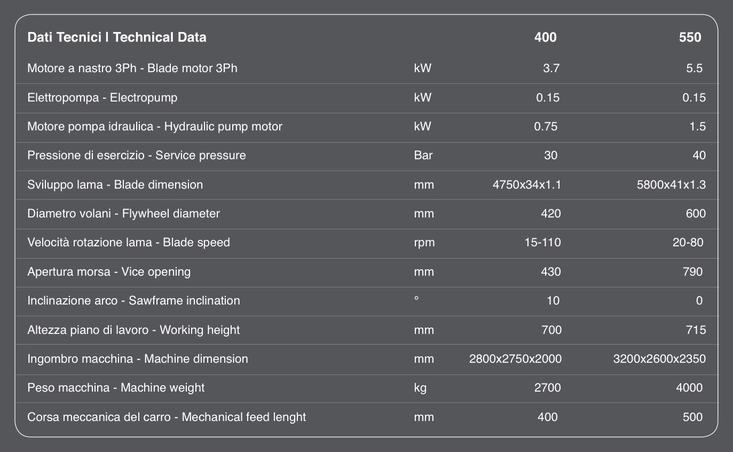 Hydraulic automatic blade tension with manometer. Precision blade-guide with hard metal pads and roller bearings. Anti-corrosion treatment with electrolytic nickel-plating and galvanization zinc plating ensure long lasting cutting precision. Powered blade cleaning brush. Electric installation according CEE regulations. High quality italian hydraulics are well laid out with fully labeled valves, solenoids and regulators. The hydraulic system is easily accessible, reducing maintenance time and expense. Set of fuses against current overload. Safety microswitches. Coolant liquid with electropump and crucible. Severe tests on mechanical tolerances, electric installation and final performance test according. Hydraulic vertical vices for bundle cutting. Rollerway 2 meters long on loading side.